Serving your event with distinction . 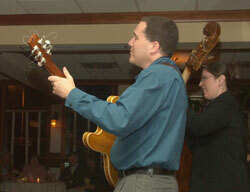 . .
What services does The Rob Levit Trio provide? The Trio provides jazz and instrumental entertainment that is venue appropriate, upbeat, and elegant. That is, their performances reflect the values and traditions of the space in which they perform and the needs of the client. For smaller events, you may choose to have The Rob Levit Duo. You may also add violin and guitar for your wedding ceremony. The ceremony duo is only available as a package with The Rob Levit Duo or Trio. Who are The Rob Levit Trio? The Rob Levit Trio is considered one of the finest jazz groups in the Mid-Atlantic and is rapidly gaining national visibility and recognition through its compact discs and performances. In fact, their new CD was recently featured on NPRâs Morning Edition. 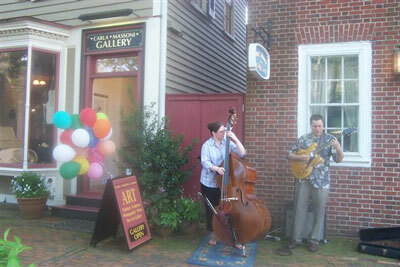 The Trio is led by Maryland Hall for the Creative Arts Artist-In-Residence Rob Levit, a five-time consecutive recipient of the Maryland State Arts Council Individual Artist Award. 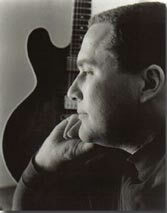 He has been described as âmusical greatnessâ by The Washington Post. Joining Rob are bassist Amy Shook, one of a handful of female acoustic bass virtuoso in the country and drummer Frank Russo, a veteran of the Naval Academy band and a sought after teacher/clinician. Why hire The Rob Levit Trio? 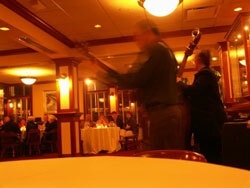 TThe Trio plays beautiful music that is always a source of delight and conversation at your event. It pushes your event from ordinary to exceptional. The Trio works almost exclusively on referral rather than advertising â a testament to its popularity and effectiveness. The Trio has a higher standard of professionalism than any other ensemble of its kind. Working directly with The Trio includes expert planning and advice on the musical component of your event, punctuality, and a sharp, professional appearance. The Trio has been in existence for almost ten years. Each musician brings countless hours of experience from military musical service, cruise ships, jazz festivals, and many other sources to create a unified group that is supremely confident in creating the perfect atmosphere for your event. The music of the Trio is appropriate for listening and dancing (if desired), a rare combination. Do you have a set list? The Trio performs hundreds of classics from memory. Rather than work from a canned set list, we spontaneously create the most appropriate music for the moment. That is why we like referrals. The Trio is hired on the basis of what they do well. Of course, special request are honored for toasts, first dances, etc. as long as they are arranged in advance. Rob Levit is an excellent emcee and will be happy to make announcements at your event for an additional fee. He does not refer DJâs, caterers, or other musicians so that he may focus exclusively on excelling on your event. Creating the best music and ambiance for your event is Rob's one and only priority. What is the fee for The Rob Levit Trio? The Rob Levit Trio has a "karma pricing policy." We do not want to charge you more than you can afford nor do we want to be paid less than you can afford. As a general rule of thumb, $1000 for a three to four hour event is standard if not downright reasonable. Yes, you can find a cheaper band for your event if you reduce our service down to an interchangeable commodity. Rob Levit and his musical partners bring over sixty-years of collective experience, dozens of references, and hundreds of events to your event. Our Trio is going to behave, perform, and provide provide the level of service that you expect from a top band. Pricing is dependent on several factors including travel, length of event, number of guests, estimated playing time, special requests, and venue logistics and requirements. The minimum fee is non-negotiable. At all events, The Trio expects to arrange reasonable breaks and appropriate food arrangements depending on the length of the event.